It’s a common headline: We are in the midst of a scary mental health epidemic. It is apparent that stress and anxiety are much more common today than a generation ago and none of our teens seem to be immune. The teen years are a challenging time for parents, many of whom struggle to find ways to support their children without being overbearing. 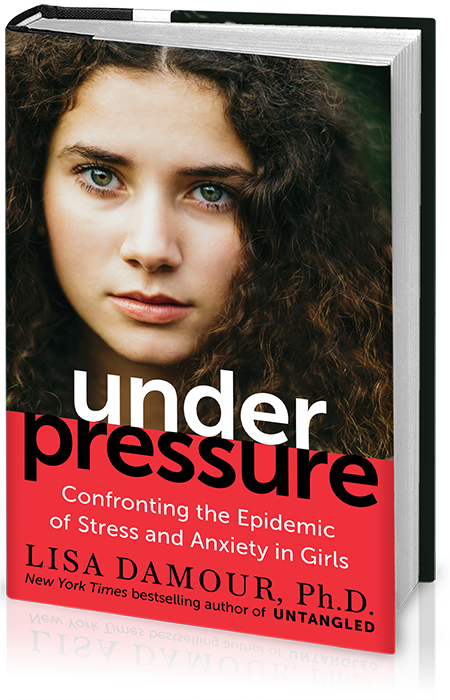 Lisa Damour’s new book Under Pressure takes a hard look at the stress today’s teens are experiencing and provides concrete examples of how parents can help. A psychologist with years of experience working with adolescent girls, Damour explores stress, pointing out it isn’t stress itself that’s the problem, but unhealthy levels of stress. She says that stress is essential for growth and development; it helps us push past our comfort zones to tackle new challenges or warn us of threats or dangerous risks. Stress only becomes a problem when it hijacks rational thought and interferes with everyday activities. Designed to help parents help their daughters (though much of the information applies to boys as well, girls are disproportionately affected by stress), the book is separated by sources of stress: home life, other girls, boys, school and the outside world. In the area of home life, Damour talks about busy schedules and their impact on mental health. She addresses technology and reminds us that we as parents know more about our children than our parents knew about us. She acknowledges that groups of girls will have conflict and addresses how today’s technology complicates communication and also impact girls’ sleep patterns, upping their anxiety. Damour talks about sexual harassment and the “double standard” that requires girls to “behave” better than boys. She makes observations some parents may miss such as: girls are overly concerned about how others feel and feel guilty about their own negative feelings, and that maintaining a “public persona” is a big source of stress, especially for those who feel that anything short of “full disclosure” compromises personal integrity. While taking risks (and the associated stress) is part of learning, too often a focus on grades and “being good” brings stress to an unhealthy level. This book makes an effective argument that anxiety in itself is not a threat but a warning system. As parents we can help our teens by acknowledging their fears without judging and talking to them; it’s important that we maintain an open line of communication. It is also on parents to be proactive and initiate tough conversations. Under Pressure is a useful guide to help us not only see the issues but also to help our teens take some of the pressure off. 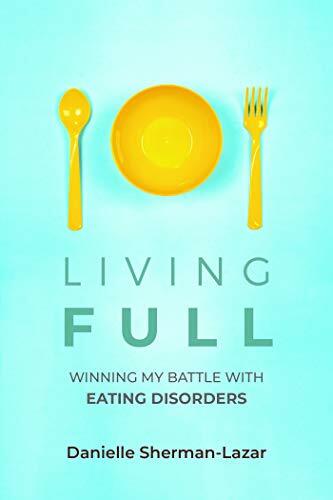 I recently read an advance copy of Living FULL: Winning My Battle With Eating Disorders by Danielle Sherman-Lazar. Particularly as a mom of three daughters, at times this book was difficult to read. (Yes, I know boys have eating disorders too, but girls seem more susceptible.) Despite this, I believe that this book should be on every family’s bookshelf. Written as a narrative from Danielle’s younger self, interspersed with excerpts from a blog she started while in recovery, it will help both individuals in the depths of an eating disorder and their parents feel that they are not alone. In a straightforward way that disallows judgments or excuses, Sherman-Lazar lays out how she felt about herself and food and clearly shows that her eating disorder controlled her. Her battle began at an early age and she suffered for years before finally acknowledging she needed help at age 26. While not explicitly stated, the point is made that (as is true for any addiction) a person with an eating disorder needs to want help for it to be effective. While the story is told from her point of view, Sherman-Lazar shows how her parents waited in the wings, immediately swooping in when she called for help, possibly fast-tracking her recovery. Once begun, she doesn’t sugar-coat her recovery and is honest about the struggles. To help others better understand the process (whether they themselves or a loved one is undertaking it) the book also includes some of the Food & Feelings Journals she was required to keep as part of her Maudsley recovery. Here she not only lists what she ate, but how she felt, about the food and herself. In the book, we learn it takes five to seven years to recover fully from anorexia. Before hitting this milestone, Sherman-Lazar became pregnant; she also briefly shares her thoughts and mental struggles (as well as some tips about what helped her) of this period of her life and suggests that being a mom (a long-held goal) helped her progress as she was determined to have healthy children and do her best to ensure they grow up with healthy body image. While the details are frightening at times, we are left with hope and the sense that, while not guaranteed, full recovery is possible. 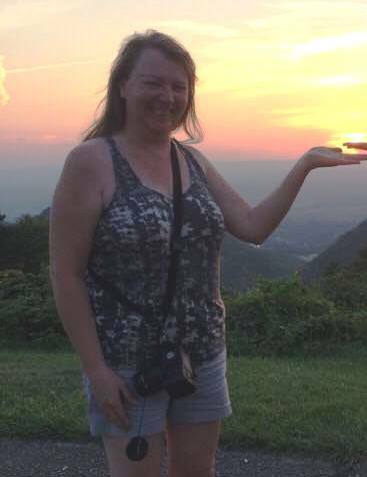 You can read more about Sherman-Lazar and her life in recovery at Living a Full Life After ED. A few years ago I was blessed to be welcomed into a group of amazing women. Many of these women are younger than I am (many are the same age as my daughters! ), but somehow that doesn’t make a difference. Other labels we are quick to put on ourselves are irrelevant as well. In this group, we talk about writing, the industry, our families, our faiths, our hopes, our fears, our everyday lives. While many of us have never met in person, we have developed very real relationship and there is genuine affection and, when warranted, concern for each other. I freely admit that I have on occasion been a bit envious of some of them. Of their success, of their fan base, of how far they have progressed, of their comfort with changing technology, even of their luck (as so much of this business is getting your work in front of the right people at the right time). But this has not changed how I feel about them. I have the same protective instincts for them as if they were my sisters and daughters.These women are honest and kind and generous. They are quick to point out that we all travel at our own pace and life sometimes gets in the way of our goals. We remind each other that life events can be life-changing or inconvenient. They can fuel our writing or stop it in its tracks. Ditto for health and family issues. As one of the older members of the group I hate to see them struggle. For them and other young women I care about, I have some wisdom I’d like to share, some things I wished I had learned earlier in my journey. You don’t always have to be the giver. It is acceptable, even generous sometimes, to be the receiver. It is unreasonable to expect that anyone will be strong all the time. Those who are used to being caregivers often have a tough time asking for help. Many even struggle to accept help when it is offered. Stop that! Flip the roles: do you feel inconvenienced when helping someone? (If the answer is yes, that is a different problem.) Accepting help is not a weakness. In fact, I would say it is a gift. Let someone else feel valued and useful for a change. You shouldn’t do it all. While it’s also true that you can’t do it all, that is not the point. We often try to be everything to everyone. We strive to be good wives and mothers, good employees and housekeepers. We agree to organize fundraisers and make cookies for bake sales. We say yes to projects we lack enthusiasm for and no to time for ourselves. We need to evaluate what’s being asked of us (even when it comes from that little voice within) and set priorities. Other people are able and willing to take on responsibilities too! Being assertive is not rude. We have to stand up for ourselves. It is no one else’s responsibility to ensure we are treated fairly. Setting boundaries makes it clear to others what behavior we will and will not accept. Telling people what we want and need eliminates the chance that they will guess wrong and saves all of us time and aggravation. Communicate your worth. It is not enough to know your worth; you need to talk confidently about your accomplishments. Take pride in what you do and let others know about it. You don’t need to brag, but don’t be dismissive of your talents and skills. If you’ve worked hard to accomplish something, that is worthy of celebration. Consider this: someone you know might be in need of your particular talent. It is acceptable to say no. And in most cases, you don’t have to say more. You don’t need to justify your decision. You get to decide how you spend your “free” time (or your donation dollars). Besides, most people don’t know how to respond to a simple no, so the conversation ends there. It is okay to sometimes be rude. While it is generally better to be kind, some people don’t respond appropriately to kindness. Some will take a kind rejection as an invitation to push harder. There are no circumstances where it is acceptable for another person (whether it’s a salesperson or even someone you have a relationship with) to pressure or bully you into a decision you don’t want to make. Self care isn’t selfish. You can’t give what you don’t have. Everyone needs downtime and some need it more than others. If your basic needs aren’t being met, you won’t be much use to others. Admitting you need help is not weak. In fact, it’s just the opposite. Humans are social and community is important. Without community, human beings would have died off long ago. We rely on each other for many things, not the least of which is the need to be needed. Being able to contribute gives people purpose. Most people are good. These days that is difficult to remember. Yes, many will insist that everyone is only “Looking out for number one,” but most people are willing to help when they see it is needed. Often all it takes is for them to be asked. It can be difficult for some to see beyond their own experience and to realize that their perceptions may not reflect reality, but they will often come around when someone kindly points it out. They say the wisdom comes with age, but there’s no reason some lessons can’t be learned earlier. I recently took a trip of firsts. 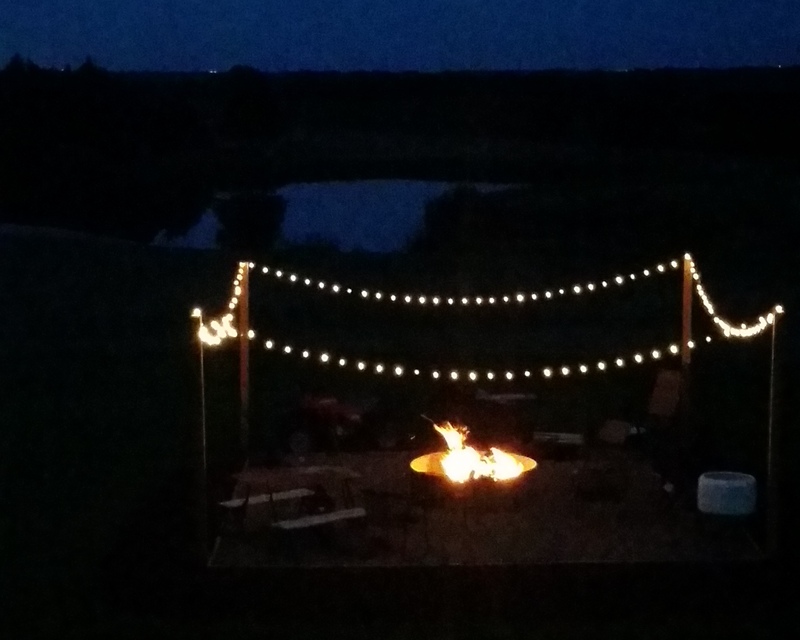 I had the opportunity to attend a writer’s retreat (my first) just outside the city of Omaha. 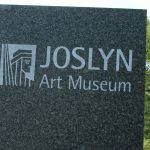 Since I had never before been to Omaha, nor even Nebraska, I chose to extend my visit by a few days and explore some of what Omaha has to offer. Since this was a work trip, I was traveling solo, which meant pushing outside my comfort zone in multiple ways. While I have flown, dined and even stayed at a hotel alone before, this was my first completely solo trip. In the past, when I have flown or dined alone, it has been part of a trip where I have met others; most of my time on those trips was spent in the company of friends and family who knew the area I was in. This time, I was on my own to decide where to go, what to do, where to stay and eat. I planned some in advance (choosing an Airbnb and setting up a rental car to be picked up on my second day) and had a rough plan of what I wanted to see and do while I was there, but no real schedule; I wanted to be open to possibilities. Without going into too much detail, the trip was a success and I found that solo travel is not too unlike traveling with others, except that conversation is limited to talking to strangers. Though it was something I gave no thought to going into the experience, I occasionally observed a curious fact: I did not stand out; no one was staring, wondering why that woman was eating or walking around all by herself. In fact, the most common reaction I got from others was surprise that I was from out of town (closely followed by asking what else could possibly be going on in the area that weekend besides the College World Series). I was pleasantly surprised that I managed to blend in. 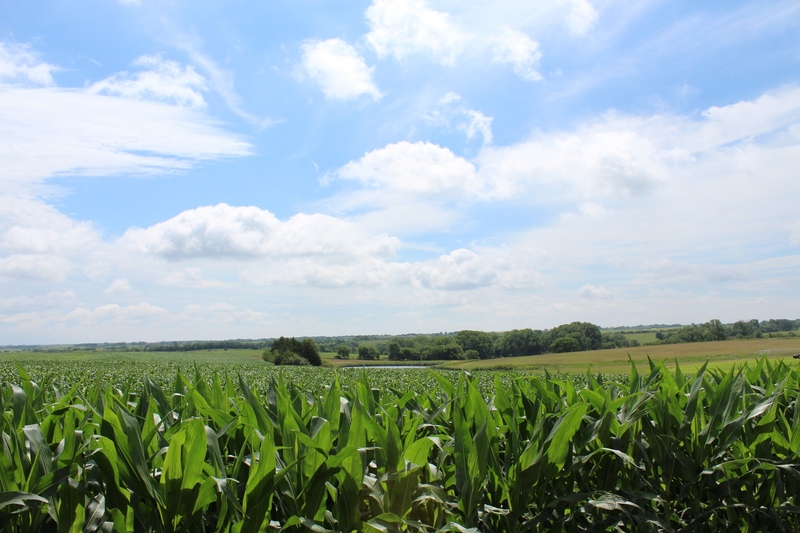 After three days of exploring Omaha, it was time for the big event: Her View From Homestock, a gathering of approximately 50 writers for Her View From Home. 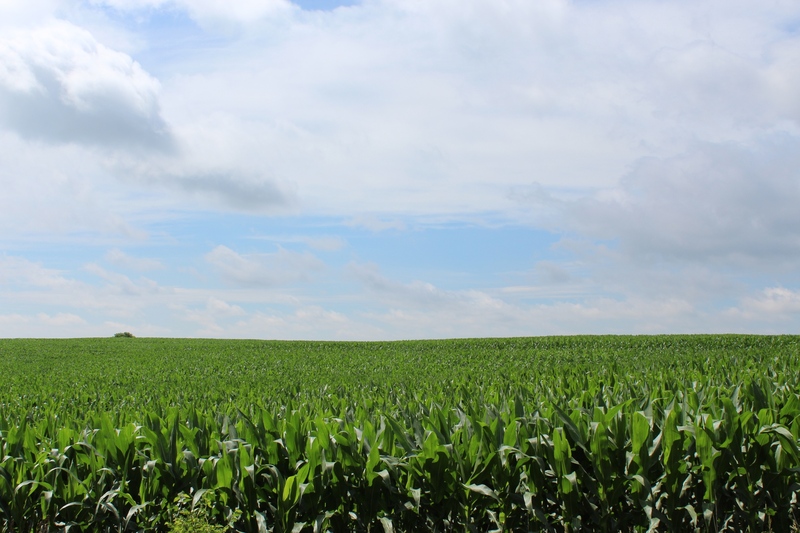 Despite the fact I had not met anyone in person before, I eagerly headed down Route 80, the anticipation building as I left the pavement for the dirt road. The weekend was everything I expected and then some. Women whom I felt I already knew from their writings gathered to share stories, tips, fears, hugs and tears. We talked about where we came from and where we wanted to go. We discussed best practices and what worked for us, despite what the “experts” say. Sharing was a big part of the weekend. We shared information about our professional selves as well as our personal lives. We talked about why we write: how we started and what keeps us going. We talked about our hopes and dreams for our writing and what passion inspires us. We talked about finding ourselves in our writing and about being true to ourselves, despite the shiny temptations dangled before us. We had been given a “homework assignment” for the weekend: to write about why we write, when we began and why it matters. While pending deadlines (and life as a mom) kept me from writing down my thoughts beforehand, I did think a great deal about this. Writing is something I have always done. I wrote “books” as a small child (index cards stapled together) and as I got older, briefly stepped away from the thought of creating books while I consumed as many as I could get my hands on. In school, writing was of course part of the curriculum, so I had less time for personal writing (though I did keep a diary sporadically). In college I joined the newspaper and my first “real” job was for a magazine publisher. 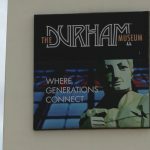 I stepped away for a while (in hindsight, it was for way too long), then with this blog, came back, only to discover that publishing had changed a bit and there was much to learn. For a long while I said I wrote because it was like breathing, it was impossible to not write. For years, I learned this was not true: for a time, mothering took its place; now I find there is room for both. Firsts are scary, yet exhilarating. They force us to step away from what is comfortable, to take a chance that what’s ahead has value, to grow as individuals. Firsts are memorable, they become stories we share (and sometimes embellish). They give us confidence; we learn from both our successes and failures how to approach a similar situation later. Most of all, they give us the courage to try again, to pursue and embrace new firsts, to make our lives even more fulfilling. In the not-too-distant past, I made “Out of the Comfort Zone” a battle call of sorts. I couldn’t be happier I did. Firsts are much more enjoyable to celebrate than lasts. Can There Be Good News About Bad Behavior? There is one thing that new parents agree on: They have no idea what they’re doing. Even when things start to go smoothly and they think they’ve finally got the hang of it, kids misbehave and parents wonder where they’ve gone wrong. The most popular learn-as-you-go gig, parenting presents many challenges, not the least of which is discipline. Each generation has had their go-to “experts” to tell them how to get kids to behave appropriately. Oftentimes, this advice contradicts that of the prior generation, leading to conflict and criticism. Parents are blamed for being too strict or too lenient. New psychologists and theories are put forth as the definitive word on child-rearing; the old ones are quickly “outdated.” The debate on nature v. nurture rages on, and the effects of biology, free will and one’s unconscious enter into conversations about how and why things are the way they are. 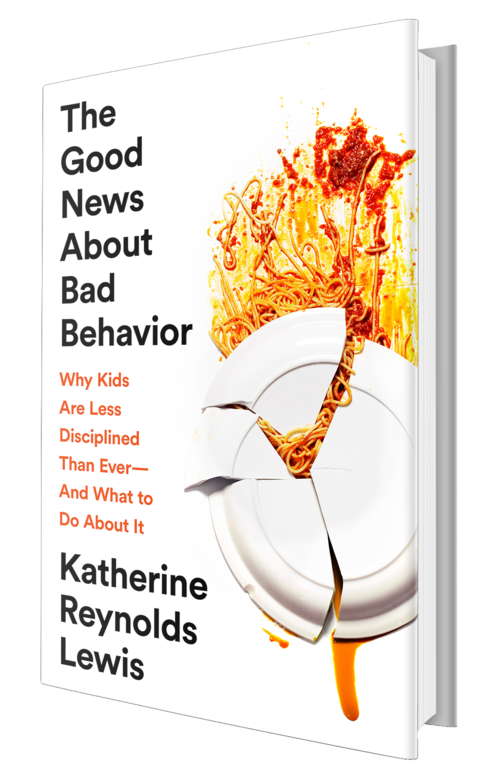 Observing that children’s behavior seems to be out of control these days, and looking for guidance with her own children, author Katherine Reynolds Lewis spent five years searching for the answer to the question: What caused this behavior problem and how do we solve it? In addition to the observable increase in behavioral issues, she learned that over the past 20 years, there also has been a dramatic increase in depressive symptoms and distractibility among high school and college-age students. Even more concerning is the statistic: “one in two children will develop a mood or behavioral disorder or a substance addiction by age eighteen.” Almost 40 percent will have two or more disorders. Consider the corresponding rise in childhood suicides, especially in younger children, those aged 10 to 14 and it is clear there is reason for concern. Excessive screen time (social media in particular) is one potential cause. Another is the pressure to achieve, both academically and in extracurricular activities. Parents are sending our kids mixed messages. Today’s educational emphasis on necessary workplace skills such as collaboration and mutual respect are inconsistent with traditional parenting methods that focus on obedience. If the goal is to raise independent adults, insisting on them blindly following rules may be counterintuitive. Instead says Lewis, parents should think about the qualities they want their children to exhibit as adults. In her recently published book, The Good News About Bad Behavior, Why Kids Are Less Disciplined Than Ever – And What to Do About It, Lewis draws from her own personal experiences as a parenting educator as well as the insights of psychologists, other educators and neuroscientists. 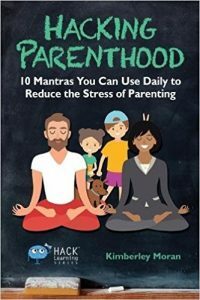 The book is organized into three parts: The Problem, The Solution, and Making it Stick, and though the title suggests otherwise, provides valuable insights and techniques for all parents, not just those struggling with behavior issues. The world has changed dramatically from the one today’s parents grew up in and many of the methods their parents used simply don’t work anymore. Family schedules and structure are different today: few children have the benefit of unstructured play. As a result, many children spend little time engaged in pretend play which, Lewis points out, helps “develop abstract thought, self-control, social cooperation, and other essential skills” as well as self-regulation. In recent generations, parents have swung to extremes in the struggle to find solutions. Studies indicate that a middle ground is best: children of authoritative parents (those with clear boundaries and close emotional connections with their children) do better on all behavior assessments than those with either overly strict or permissive parents. Lewis goes a step further in receommending an Apprenticeship Model of parenting, which has much in common with Authoritative Parenting but adds an important component: modeling behavior. 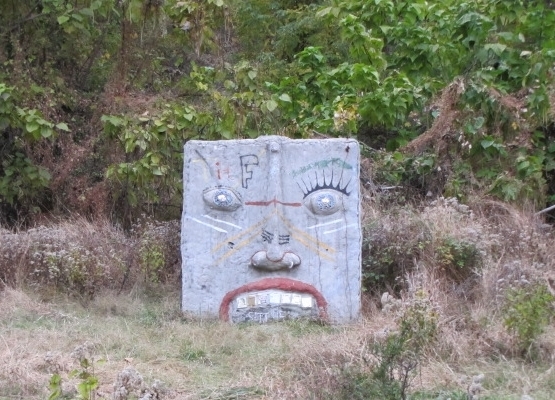 Her approach utilizes techniques from four different “schools” and includes techniques proven in educational settings. She encourages parents to look at their own lifestyle and background and take from these philosophies whatever elements they think will work for them and abandon what won’t. Every family is different, so there is no one-size-fits-all answer to good behavior. When it comes to discipline, Lewis advocates research-based models that include three components: connection, communication and capability. She says parents need to connect with kids to create an environment in which they will cooperate. They need to communicate their expectations and just as importantly, to listen to their children’s questions or concerns. Finally, parents need to coach their children, modeling skills that will build their capability. Like any other skill, behaving appropriately is something children need to practice and fail at in order to master. Parents should look at behavior issues as learning opportunities for areas in which children need to develop a skill. This may require a change in approach and can be difficult. For starters, parents need to listen more and adapt their language. Lewis points out what should be obvious: “adults and children alike lose access to the learning and problem-solving parts of the brain when they’re emotionally ramped up.” As all parents learn, threats are not effective in changing behavior. Corporal punishment and harsh verbal discipline also have little positive effect; they cause a fight-or-flight instinct. It is not news that children internalize the labels they are given. Lewis makes useful suggestions on how to change the way we speak and listen, such as the thought-provoking: use words you would like to be applied to your child (by himself or others) at age twenty-five. Drop the labels and instead communicate the problem or issue that needs to be addressed. Many of the concepts suggested here are not new but are presented in ways that make sense with practical suggestions to implement. While the process is not easy, Lewis points out that once children master these skills, it will become second nature and the result will be more independent, capable adults. And isn’t that our ultimate goal as parents? Are You Really Saying What You Think You Are? 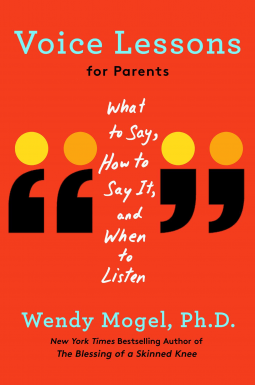 In Voice Lessons for Parents: What to Say, How to Say It, and When to Listen, Wendy Mogel, Ph.D. provides a guide for parents to communicate with their children at all stages of development. Relying on three decades of experience working with parents and children as well as new research on neuroscience and biology, she provides guidance for all parents who may be struggling with communication in their homes. She stresses that parents need to adapt their communication style to the child. Factors such as age, developmental level and even gender all play a role in determining how best to talk to a child. She points out that learning communication skills is an ongoing process and that parents should actively engage their children in conversation from infancy through adulthood. At its best, communication matches the cognitive development, interests and temperament of the child. Parents do this instinctively with babies, and narrating everyday activities helps with speech and vocabulary development. Early conversations with children are about teaching communication skills, for example, when to talk and when to be silent. With older kids, being quiet and listening is more important than speaking. Model the behavior you want to see. Ignore your own technology in favor of in-person conversations. Mogel discovered that techniques used by voice teachers can be valuable. Use of these techniques can influence how parents are heard, help parents hold their children’s attention and encourage engagement. She points out that the high-pitched, high-volume voice so many parents use when they are frustrated conveys a loss of control and is counter-productive, resulting in their children tuning them out. She encourages the use of vocal techniques and self awareness to promote better communication. Studies show that male and female brains are different and develop skills at slightly different rates. These differences are spelled out with helpful suggestions on how to talk to children, using their age and gender as a guide. The author likens communicating with boys to working like an anthropologist, while with girls it is better to take an approach like a sociologist. As children enter the teenage years, separation is developmentally appropriate. Though it may be difficult, when talking to them, parents need to remember these vocal techniques and that certain traits are common to teens (and temporary). More tips include: Ignore the attitude rather than take it personally; Use chores as a time to talk, and take full advantage of these moments. The book rounds out with tips for talking to grandparents and avoiding/handling issues that frequently arise as well as tips for clear communication with nannies, teachers, coaches, etc. It also includes lists for parents of teens, such as: Things teens would like to say to parents; Ways to make teens feel loved; Things that parents don’t need to worry about; and Advice to parents. Voice Lessons reinforces the importance of communication in family life. It not only addresses talking to kids, but also acknowledges that moms and dads have difference approaches and that’s okay. The author reminds parents to model appropriate communication with their partners, pointing out that kids watch how adults act and often learn more from that than what they are told. I generally don’t make New Year’s resolutions. I believe in setting goals, but making grand declarations just because the calendar changes seems silly to me. That being said, I do have one goal that I need to get serious about and I wish that more people would stop hiding behind politeness and support me in my efforts. I know that weight is only one aspect of good health, but right now it is my biggest challenge. When I was in college, I was skinny. Though I didn’t feel that way at the time, I was content with the body I had. Honestly, I didn’t think much about it. I got some comments (from friends of my parents mostly) that I was too thin, but I didn’t (and still don’t agree). I wasn’t athletic, but didn’t have to work out to keep my shape. 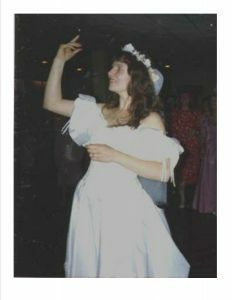 I had the kind of body that could wear anything off the rack (even my wedding gown fit without alterations) and the kind of metabolism that allowed me to eat just about anything I wanted. Somewhere after baby number two, that all started to change. 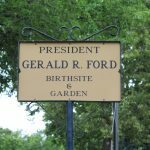 As I approached 30, things began to resettle in new places. I know the hows and whys, and of course on a certain level knew that I would have to start paying attention and take better care of my body, but I didn’t, for a number of reasons. As a result, my current weight is a little above where I was the day my oldest was born, which while not quite considered obese, is definitely outside the healthy range for my height and build. Now that I’ve crossed the 50 mark, I am facing new challenges. My metabolism has gone on strike. A single alcoholic drink adds pounds. Miles of walking seems to make little difference. It doesn’t seem fair to deprive myself of all guilty pleasures, but I want to be healthy. Over the past ten years, my weight has been up and down and honestly, I haven’t gotten as serious about it as I should. I know I am significantly increasing my chances of certain health problems, and I am upset that my clothes don’t fit the way they should. I try to be conscious of what I eat, but when I do, it seems that other people take issue with that. If I comment on my body, saying something as simple as “None of my clothes fit,” or “I really have to lose some weight,” I have people arguing with me, telling me I look great. I find this frustrating, and really wish they would stop. I’m not saying I want people to point out my bulges; however, people are making it more difficult for me to be healthy. We live in a culture that places a ridiculous value on consuming food and drink. Most social occasions include or even revolve around eating and drinking, and for some strange reason, people pay attention to what others consume. Saying no to dessert prompts the response: I shouldn’t deprive myself, I deserve it. Or there is the attempt at guilt: “It will just get thrown out if you don’t eat it.” Pointing out that I am overweight often elicits an almost angry response. I am told that I should love my body and not be ashamed of it. This makes no sense. I am not ashamed of my body. I am disappointed with myself for not exercising more and am nostalgic for the days I could eat all the desserts and still keep my tiny waistline, but I am not ashamed of my body. After four pregnancies and many years, there is no possible way I am going to have the body of 20-year-old me. I don’t have the desire to get back to my pre-first-pregnancy size, I just want to be healthy and once again like the way my clothes look and feel on me. I am proud of all this body has done and even some of the things it still can do. However, I want to be able to continue doing these things. I want to actively enjoy my life to the very end. I want to be able to keep up with any future grandchildren I may have. To up the odds of all this, I need to lose weight and get in shape. So please, if I mention I want to lose weight, please don’t tell me I look great. Either say nothing at all or offer to go for a walk with me. It might even be fun. There is something about having my entire family close by that is calming. I know from talking to other parents that I am not alone in this. Being together brings on a pleasant rush of peace and contentment, no matter how fleeting it may be. I guess in part it’s because I know where everyone is. There is no wondering about where they are if they are making good decisions. If they are with me, I know what they are doing and equally important, I have an idea of how they are doing. Just because I love bringing them all home doesn’t mean the time is all sunshine and rainbows , though. Like many families, we occasionally clash, sometimes loudly. We disagree and grouse about differing habits (like getting up too early or too late) and having each other underfoot. When we plan to go out, the struggle to get everyone ready to leave at the same time is sometimes as real as the toddler days. 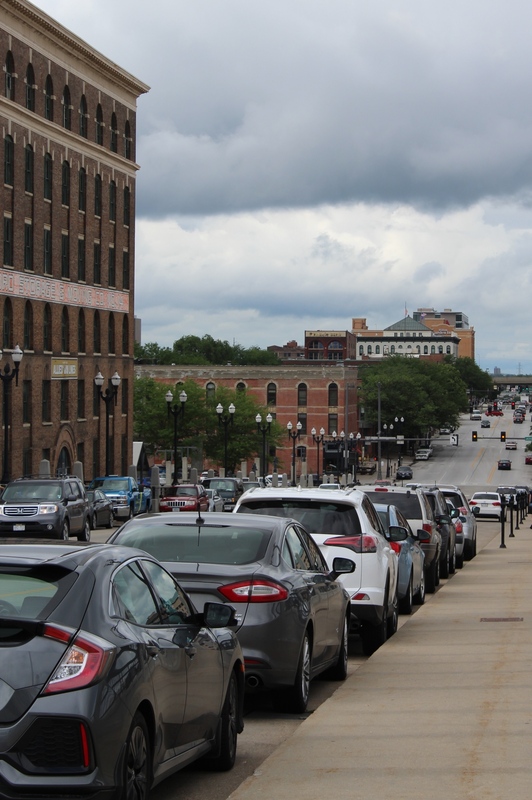 Use of the car needs to be scheduled in advance and accommodations made to get everyone where they need to go. Despite the chaos, I try to savor the moments. I am well aware that they are fleeting. The years leading up to now have gone much quicker than I could have ever expected. Though I have some responsibilities that cannot be neglected, I try to rearrange my schedule to be available. I try to get some work done in advance, so that I have a little more free time over breaks. I try to expect less of myself, knowing that in the not too distant future, my time won’t be in such demand. I try to squeeze things in early in the day (when they are usually still asleep) or complete tasks in the small pockets of time when they are busy with other things. I try (and sometimes fail) to let things go, to not think about how much I’m not getting done, how much I will have to do later, when they once again are off, learning and growing. Impromptu lunch dates and shopping trips with my kids give me a glimpse into the new world they now occupy, a world apart from me. After spending a lifetime as the center of their universe, these insights are sometimes startling, and often fresh and enlightening. I remember watching them grow from babies to children to teens, noticing small leaps in development. Now they have grown without me around, which is fun to watch, but can be disconcerting. Nights spent snuggling on the couch, watching favorite TV shows together, and afternoons of Netflix binging seem less decadent knowing how briefly these moments last. Sunday afternoons cheering on the NY Giants with my youngest are much more exciting than watching alone. Hiking local trails renews spirits and resolves and though I know such trips are good for me, it is easier to justify them when there is the opportunity for quality parent/child time. While the menu planning becomes more complicated again, I become reacquainted with the foods they love and sometimes discover a change in the palate. Where tomatoes were once scorned, they are now requested. Spicy food was taboo, now the tolerance has grown. Some food that were once favorites are now just “okay.” Sometimes there are requests for new items and we are exposed to new foods as well. On occasion, this means my cooking duties are reduced or even eliminated. The sibling relationships change too. There is a reluctant acknowledgment that the younger ones are now grown up and worthy to be part of the “big kid” conversations and activities. The alliances shift as they agree and disagree; sibling battles still crop up, yet they are fiercely protective of each other to the outside world. During conversations, I try to figure out relationships and decipher if the friend in question is one from college or high school (my kids have a knack for finding several friends with the same first name). I hear names tossed around with familiarity, to the point where I get confused as to whether I know said person or have just heard much about him or her. As I struggle with managing my professional goals, I try to keep in mind life goals. 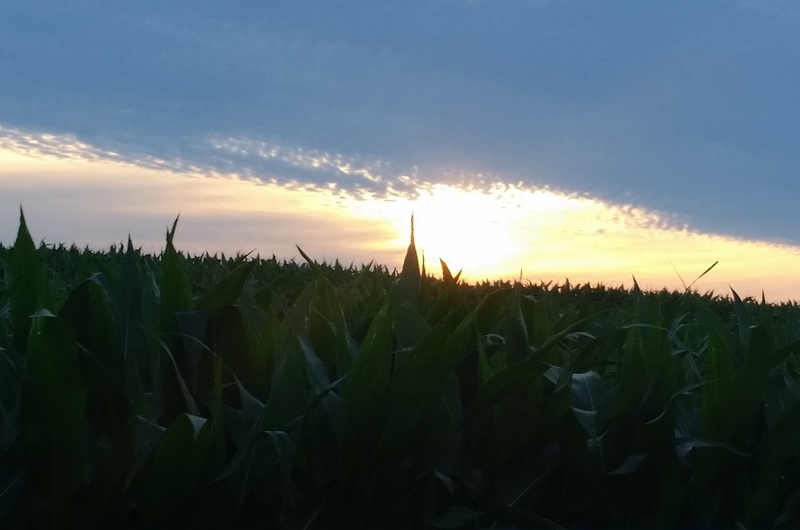 Sometimes it is difficult to keep the big picture in mind; the everyday can get in the way. 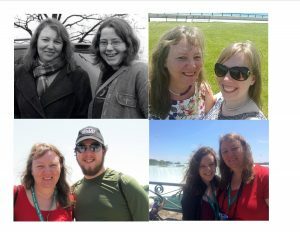 My children aren’t little anymore; in many ways, this makes them more fun to spend time with. I know that soon, their lives will take them to new places, without me and my time with them will be minimal. So today, I choose to spend time mothering and continue to work myself out of a job. This was first published on Sammiches and Psych Meds. The mantras are simple and focus on understanding needs, building relationships and fostering independence. While there are no easy answers, solutions are sometimes simpler than we realize. She advocates using a parenting journal which she calls a Parent Resource Notebook (PRN) to record thoughts, track progress and milestones and to reflect on them, causing parents to be more intentional rather than reactionary. Each chapter includes suggestions on how to use your notebook as well as helpful ways to deal with “helpful” family members, friends and even strangers who question your parenting. A section at the end of the book offers handy templates to help you get started. The focus here is on the individual. While learning what milestones are typical at each age is helpful, these should be used as a guide. All children learn and mature at different rates. The point is for them to make progress. Skills are mastered gradually and in many cases, mastering one is required before attempting another. Moran points out that “we don’t really think about all the processes involved in being a person, and that’s why we parents get so mad when something that seems so easy to accomplish isn’t being done.” As parents, we are our children’s first teachers, yet in many ways, we are learning as much as they are. The book is an easy read (I completed it during a recent three-hour flight) and is designed to be used over time, “to assess your child within a situation, and then make a plan or use your intuition to help you and your child grow.” Moran stresses that parents need to trust themselves and shut out some of the noise of the outside world. Judgement has no place in her process. There are no hard and fast rules. In fact, she promotes flexibility in parenting and advises parents to “let go” any part of the plan that simply doesn’t work for them. In essence she has created what so many have asked for: an easy-to-use parenting manual to help get through the rough spots from when our children are young all the way through adulthood. 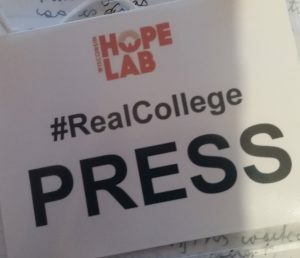 Yesterday I attended the second annual #RealCollege: A National Convening on College Food & Housing Insecurity. Just about a year ago, I learned that there is a significant issue on college campuses today: too many students go without proper housing and not enough to eat. I was surprised at this fact and the deeper I explored the issue, the more surprised I became. Earlier this year, I wrote about the incidence of college hunger for Pacific Standard and The Progressive. A two-day conference (one day of panels and one of workshops), #RealCollege was eye opening in many ways. Many speakers commented (in a thankful way) that they knew they didn’t have to explain the issue, that those in attendance already knew the scope of the problem; many also expressed relief that finally people are talking about it. As evidenced by the attendance (twice what was expected, which was more than double than last year’s number) those who are working for a solution are now finding each other and sharing resources. 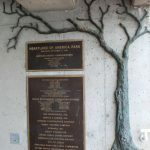 Sara Goldrick-Rab (founder of the Wisconsin HOPE Lab that has fast-tracked researching the issue and connecting resources) stressed that unlike many other fields, this research is collaborative, not competitive. Their research found that “people were doing this work around the country and had no way of communicating about it.” This year’s 400 attendees came from 29 states and the District of Columbia, included representatives of 108 colleges and universities (including presidents and faculty), as well as foundations, community-based organizations and 40 students. We need to increase awareness of problem. The incidence may be higher, but this is not a new issue. Insufficient food and housing has been a concern for some college students for decades. Awareness is growing, but it is still an invisible issue. We need to acknowledge that it is a societal problem, not an individual problem. We have the data to demonstrate the issue is significant and systemic. There are many intertwined circumstances that contribute to the problem and we will need to use a multi-pronged approach to find solutions. We need to increase awareness of available services and programs. Programs and services aren’t effective if no one knows they exist. The communication and collaboration of the past few years are encouraging, but more needs to be done. Many people are unaware that they are eligible for programs such as SNAP, TANF, AFDC, Medicaid and HUD services, or do not know how to apply for them. Some individuals even lack the resources to access the FAFSA. Some states have supplemental programs and many community organizations provide more specialized services. More than 500 colleges today have food pantries on campus (some are open to all students, not just those with demonstrated need) and some offer text alerts about when and where free food is available. At some schools, professors have been encouraged to provide lists of resources on syllabi or through other means. Though all this is useful, more needs to be done to inform students that they have options and resources. We need to reduce stigma and shame. Food and shelter are basic needs. There is no shame in asking for and accepting help. Many of us are just a paycheck or two from being in the same situation. We need to look at hunger and homelessness as temporary, with those experiencing it as “going through a rough patch,” not as a static state of being. Moving resources out of the shadows has proven effective at many schools. Providing a community approach, with help applying for services and positioning food (and wardrobe) cupboards in central locations has increased participation rates. Professors who offer to help students who may be struggling with food or housing insecurity make themselves more approachable to students in need while also educating everyone that these situations are not isolated incidents. We need to include students in the solutions. This requires two-way communication. We need to advertise services in a way that gets the message to the people who need to hear it, and we need to listen to what they really need. This will likely vary from school to school. Students at urban and rural schools have different needs, as do students of different ages and from different cultural backgrounds. Food pantries are nice, but in most cases can only solve part of the problem. Housing, transportation and child care concerns are other common issues that need addressing. Some students also benefit from guidance in things such as financial management or cooking skills. Open, non-judgmental communication is necessary. The most emotionally powerful moment of the day came during one of the Q&A sessions. One of the panelists, Justice Butler, until recently a homeless student, in a clearly impulsive moment, asked all those who have at some point been homeless to stand. The room was silent and a significant number of attendees (close to 10 percent) stood, some nervously. She then asked them to look around. Many were visibly surprised how many others were standing, as were those of us who remained in our seats. It was a powerful visual of how invisible the issue truly is and how you have no way of knowing what others’ lives are or have been like. You can’t “see” homelessness. Before leaving to catch my train, I took a moment to talk to Justice, whom I interviewed for my articles and had been looking forward to meeting. A few of us talked a bit about the moment she asked people to stand, how powerful it was and how it was impressive that a safe space had so clearly been created during the day that enabled so many to be willing to share that fact. Justice introduced me to people who had traveled with her from Houston, making a point of telling them that I was the one to write the PS article, making more fuss than I thought warranted. A bit embarrassed by the attention, I protested, but was stopped and thanked by one of the young women. She pointed out that it is exhausting simply trying to survive and to have to tell your story, over and over, is sometimes just too much. I replied that though I felt it wasn’t much, sharing their stories is one thing I could do. We parted with a hug. As a society, we can and should do much more. As former U.S. Secretary of Education and current CEO of Education Trust, John King, said in his keynote address, students should be able to “prioritize their education without it becoming a competition with their basic needs.” No one should have to choose between learning and eating.